Do you have someone or a few someone's who are there for you? You know, when life is tough.. and you feel down and out? When you are busy and need an extra hand or a shoulder to rest upon? Take a moment to send a hand-stamped Thank You card. Created from our recent crafternoon card making class this hand-crafted card is perfect to celebrate those in your life who do so much and ask so little. Show them that they shine with a dazzling card. The Happy Happenings stamp set is a fun multi-greeting stamp set and they tie in together. Laying them out with a space in between I can stamp them at the same time using the Jet Black Stazon ink. The new Triple Banner punch is so much fun! It cuts any length of banner in three widths (2", 1-1/2" and 1") with ease! Layered over this stunning Timeless Elegance Designer Series Paper for a cool and elegant look. 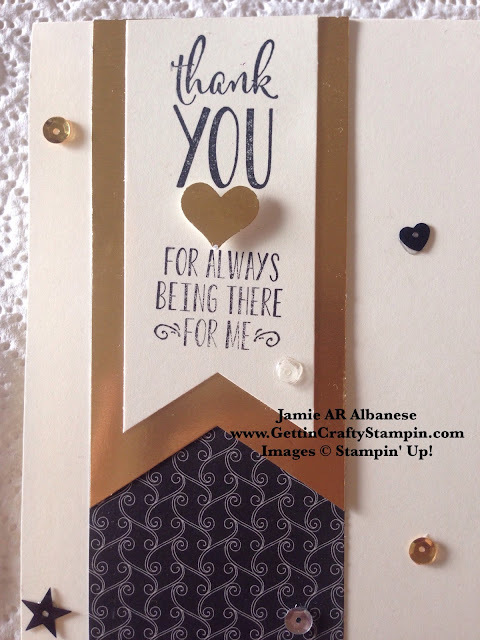 The Gold Foil piece that is punched off is perfect to use and punch with the heart from the Itty Bitty Punch Pack. Pop it up with a Stampin' Dimensional between the sentiments - BAM! Frame out this fun greeting with some dazzling shine! Using the Metallic Sequin Assortment with the Liquid Adhesive and take this card up a notch. A thank you goes so very far in showing your appreciation. Simple words taken up a notch when you take a moment to create a hand-crafted card just for that special person in your life. Join Us in creating works of art that you can give away/mail. Say Thank You to those who are just a blessing for being who they are and how they are there for you. I can't help but say Thank YOU for supporting my passion for crafting - God Bless you and yours from me and mine - xoxoxo.